I’ll try to describe how I interpret the “view” that’s harmless yet so contagious. It’s characterized as, ‘A Generals View’ (ch.171), and is currently depicted resembling a panoramic field of view. Shou Sa claims that it’s different for Shin, he’s on a higher plane altogether. I interpret this as the ability to discern distinct patterns on the battlefield. Patterns not visibly clear under less strenuous conditions. Everything within the peripheral vision appears transparent and sharper both vertically and horizontally. In other words, this ability increases one’s observable area exposing what previously wasn’t so apparent. Imagine, if you will, a heightening of the senses at will (that would be cool unfortunately impossible). Or is it? Ou Ki described it as, “seeing various things”. This, of course, is a vague generalization as it can signify many things. In fact, some may interpret it completely different from what I described. Either way, until we get a more detail description about it I believe I’ve narrowed it down to an altered state of perception. We think we know what triggers it but every individual is different so it could be a combination of things that first act as a catalyst. Wonder if Kyou Kai experiences the “view” the same way Shin does or does she tap into a completely different faculty altogether? We know that when she dives deep into the ‘Priestess Dance’ everything around her begins to slow down, which in and of itself is freaking awesome, if you ask me. What about Ka Ryo Ten and Mou Ki? Where will they fit in as we move ahead? Is it different for strategists? Is it different for those who take part in warfare but don’t physically do battle? Specific individuals who merely rely on logic. What does Ou Sen and uber intellectuals like him see? What about the amazing mastermind Ko Shou (ch.499)? 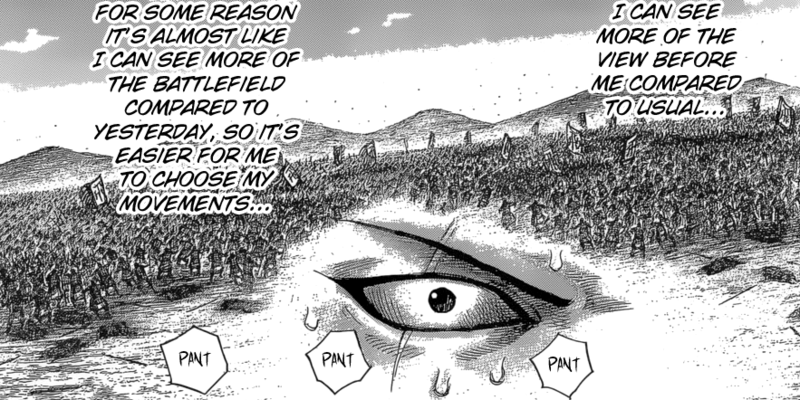 We were first introduced to the two types of Generals by Ou Ki (ch.66), and from that moment onwards learned that the two types unless explicitly identified are not easy to detect and even more difficult to identify with multifaceted characters that possess a high degree of intellect and skill.